Specifications are helpful when you’re trying to compare two different mobile devices, but the devil is in the details — especially when you’re looking at unreleased products. Here are some tips that will help you better evaluate phone and tablet specs. Real leaks from Apple employees and their suppliers are rare. Go back and read all of the Apple rumors last summer, and you’ll see most of the predictions turned out to be wrong. Sadly, tech blogs print these rumors to increase their page views – even when they don’t have an accurate source. It’s not unusual to see differences in the specs listed by a handset manufacturer and different carriers. Carrier customization is quite common. Expect to see differences in the network type (HSPA, HSPA+, LTE, WiMAX), operating system version, device thickness and weight. Sometimes even screen size and processor speed varies. 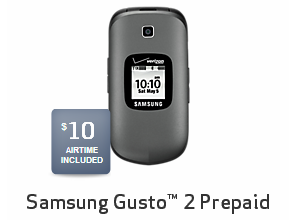 For example, the official Samsung website says the Galaxy S II has a 4.3” screen, but T-Mobile’s version of the same phone has a 4.52” screen and more powerful battery. It’s also taller, thicker and has a faster processor. 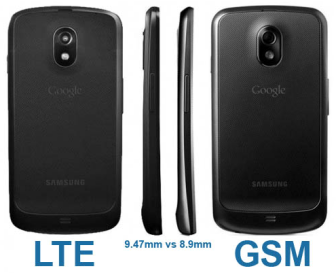 As you can see in the image above, the LTE version of the Samsung Galaxy Nexus is thicker than the GSM version of the same phone. The reason for the .57mm difference is the addition of a slightly larger battery, needed to power the juice-hungry LTE radio. There are different ways to measure brightness, viewing angle and battery life. Because of this lack of standardization, we have to accept what manufacturers tell us. Specs like battery life and brightness are often exaggerated. Screen density (PPI) is another spec which is sometimes suspect. Was it provided by the panel manufacturer, or calculated using a formula? Speaking of truth in advertising, let’s talk about thickness. Most manufacturers use the thinnest part of a device for this spec. 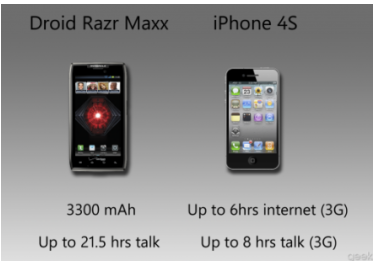 As an example, the 7.1 mm Motorola Droid RAZR is the world’s thinnest 4G device. But the RAZR has a large hump at the top, which is at least 11 mm. Shouldn’t that be mentioned on the spec sheet? The Droid RAZR has a hump at the top which increases its thickness. The specs listed for unreleased devices on sites like Phone Arena are often incorrect. Not all of them are wrong, but errors are common and some specs aren’t available until after a device has been released. 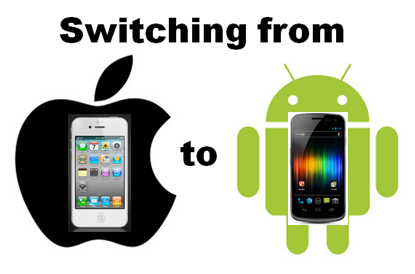 Don’t assume your phone will get new software updates right after they are available. It took HTC 9 months to release an Android 2.3.4 update for the Droid Incredible. Some devices will never be able to upgrade to Android 4.0. Some handset manufacturers will do anything to release the newest handset technology first – even if it means rushing it to market (e.g. AT&T). Others, like Verizon seem to take forever. 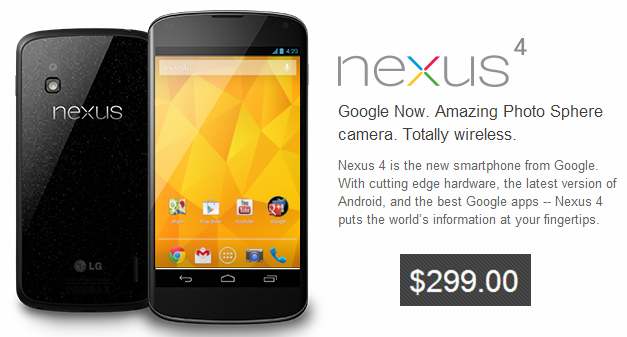 For example, the Droid Bionic was announced at the 2011 CES, but wasn’t released until 9 months later. And last, but certainly not least, processor speed isn’t the only indication of performance. 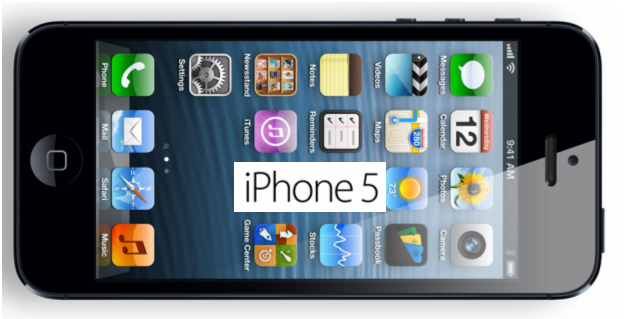 The iPhone 4S only has an 800MHz CPU, but outperforms the Samsung Galaxy S II in some benchmarks – even though it has a 1.2GHz CPU. The OS, mobile chipsets and especially the graphic coprocessor can have a major impact on performance. 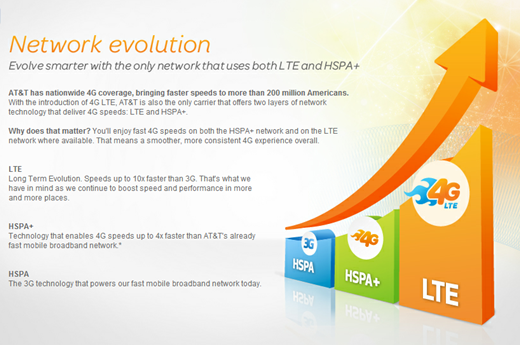 AT&T's marketing chart correctly places HSPA+ in-between 3G HSPA and LTE when it comes to data speeds. 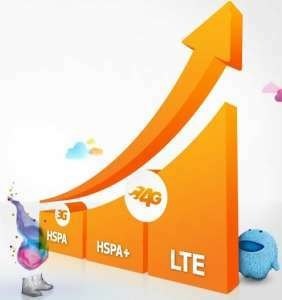 Data speeds can have a huge impact on the perceived speed of your mobile device, but there is much confusion around 4G. For the past year all of the carriers have been running commercials about their 4G networks. Truth be told, until recently, Sprint and Verizon were the only U.S. carriers with true 4G networks and mobile devices to support it. 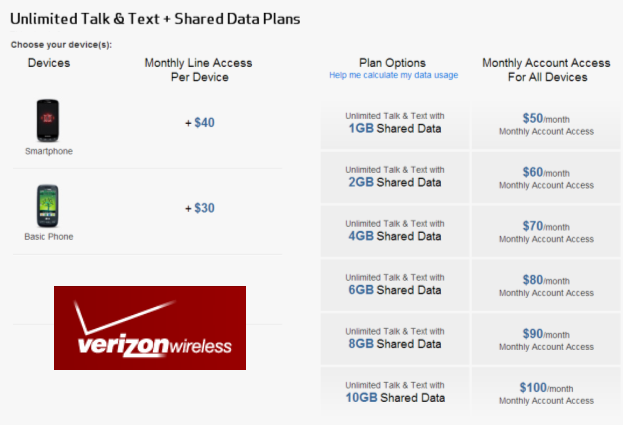 Verizon launched their 4G LTE network back in December of 2010. 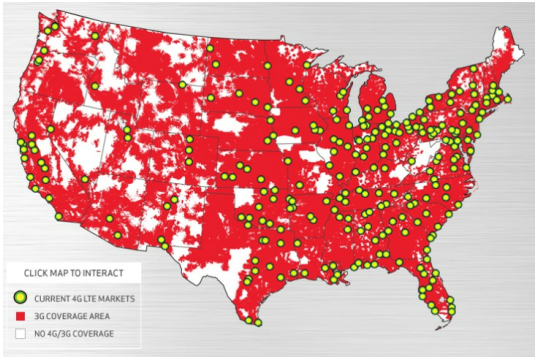 AT&T launched LTE in five cities in September 2011 (9 months after Verizon), but didn’t have a single 4G phone until November 2011. 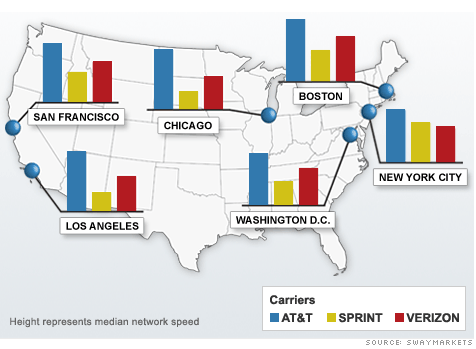 If you’re fortunate to be in one of the 200+ cities with LTE coverage, you’re in for a real treat. LTE is much faster than 3G or HSPA+. How much faster? Verizon claims LTE speeds which are at least twice as fast as AT&T’s 4G HSPA+ and up to 12 times faster than their own 3G speeds. Most LTE users experience real world download speeds of 5 to 12 Mbps and real world upload speeds of 2 to 5 Mbps. These speeds are impressive, but they are conservative. I’ve experienced real world LTE download speeds as high as 45Mbps and upload speeds as high as 28Mbps. Theoretical peak LTE speeds are even higher than these. More info. 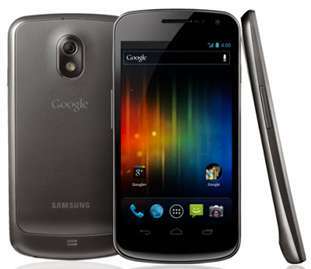 The Samsung Galaxy Nexus is on of the few phones with LTE and Dual-Band Wi-Fi support. The list of smartphones which support LTE today include the Samsung Galaxy Nexus, BlackBerry Torch 9810, Droid Bionic, Droid Charge, Droid RAZR, HTC Rezound, HTC Thunderbolt, HTC Vivid, LG Revolution, Pantech Breakout, Samsung Galaxy S II HD LTE, Samsung Galaxy S II Skyrocket and Samsung Stratosphere. More phones are being added to this list every month. The list of tablets which support LTE today include the Motorola Xoom, Motorola Droid XYBOARD(8.2″ and 10.1″), Samsung Galaxy Tab 8.9, and Samsung Galaxy Tab 10.1. 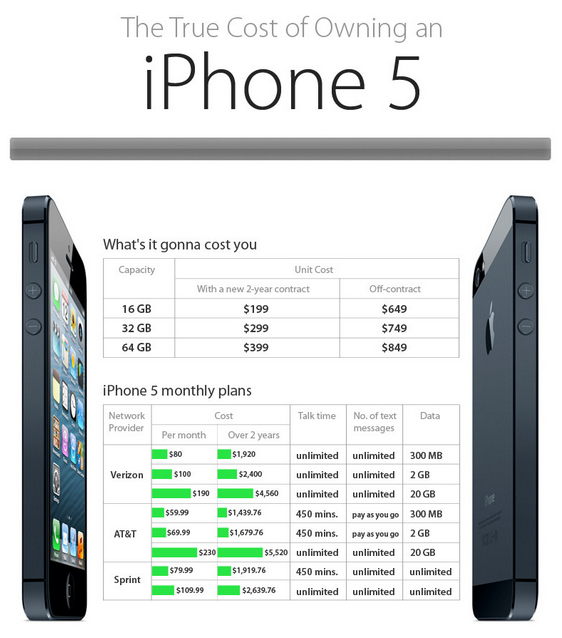 Why isn’t the iPhone 4S listed here? Unfortunately, LTE support isn’t yet available on the iPhone or iPad yet. LTE phones consume power faster than non-LTE phones. For this reason, in the past some people disable 4G when they weren’t using it. Fortunately most newer phones have more powerful batteries which make this less of an issue. LTE isn’t available everywhere, and even if you live in a city that has it, you may not always be able to get a 4G signal. 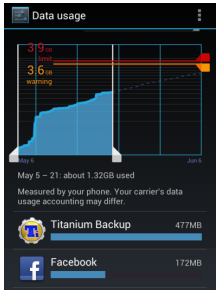 Wi-Fi data speeds are important as well. The best mobile devices support dual-band Wi-Fi. That means they work on both 2.4 GHz and 5.0 GHz Wi-Fi networks. 5.0 GHz networks are less crowded and capable of higher speeds. You can learn more about 5 GHz and view a list of devices which support it here. Some new mobile devices also include support for Bluetooth 4.0, which promises better range and lower energy consumption. After reading this, you should be better prepared to evaluate the carriers confusing marketing messages about mobile data speeds. 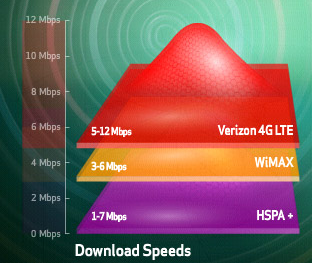 If data speeds are important to you, it’s essential all of your mobile devices support either LTE or WiMAX. My next post will be about Rhapsody’s new cloud-based music service. You can read about that here.